This picture is of myself and my friend Dylan. 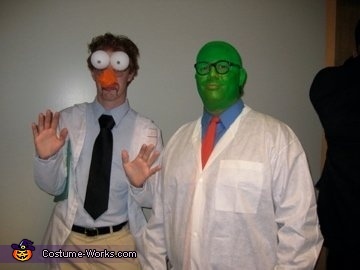 We went to our College Halloween concert as Beaker (Me) and Dr. Bunsen Honeydew (Dylan). I had been told in the past that I resembled Beaker and that I should go as him for Halloween so I convinced Dylan to be Bunsen and it was a hit. It's a simple costume and takes little effort to put together. For Beaker, I cut the bottom of two styrofoam balls (you can get these at a marshal's or Joan's Fabric place) and placed them on top of my glasses. The nose I constructed out of small pipe cleaners and orange felt which i tied around the nose piece on my glasses. The rest of the costume is just a white lab coat and shirt with tie. My friend covered his face in a green paint and put a plastic bald cap over his head which he painted as well.